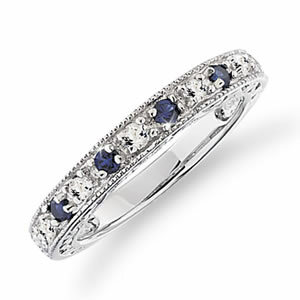 There is nothing more captivating than the deep blue color of a Sapphire accented bridal ring. A favorite of royal families for centuries, this mesmerizing color has become a popular favorite with today’s brides, royal or not! this matching wedding band featuring created Sapphire and White Topaz. This Sterling Silver ring is lavishly plated in Platinum. A wedding band fit for a Queen! ORDER THE COMPLETE 2-PC. SET and SAVE!